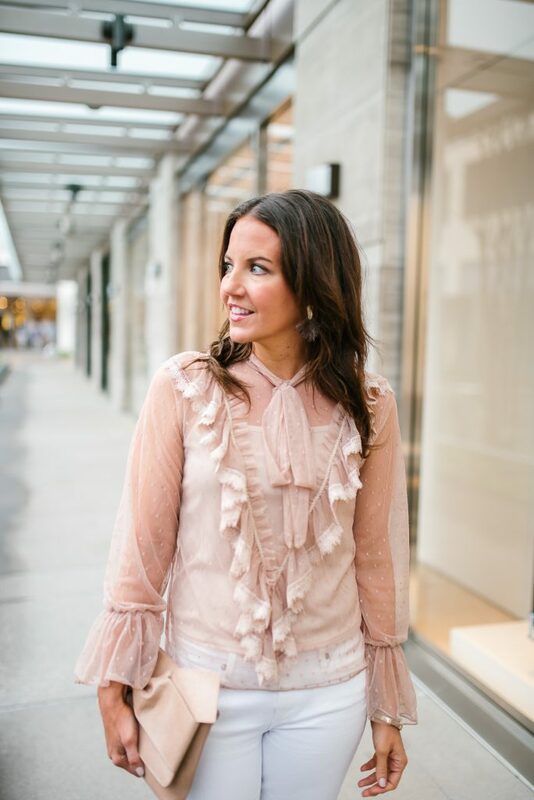 Back in December, I was lucky to attend an event for BeautyBio and listen to founder Jamie O’Banion speak. One of my favorite things about listening to her speak was hearing her passion for creating amazing skincare products. 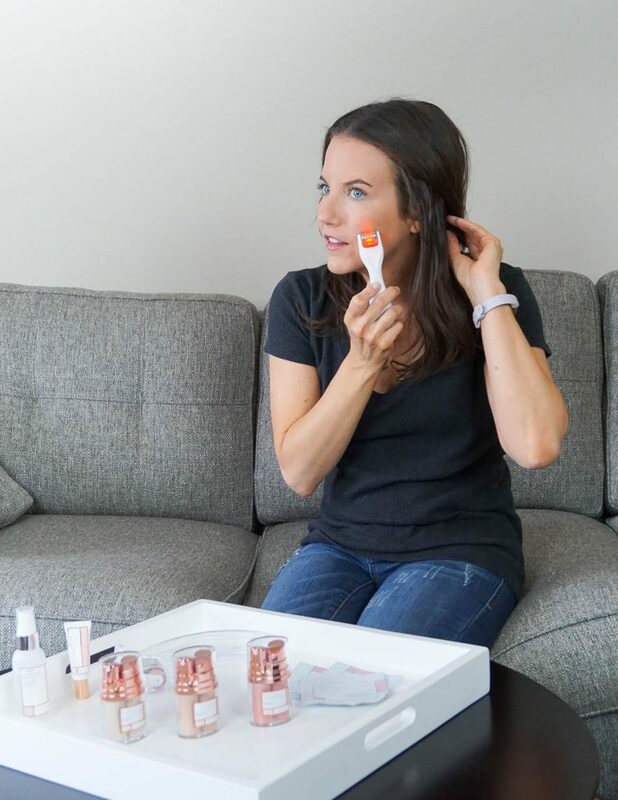 She shared about many of the BeautyBio products and gave a little lesson in skincare. 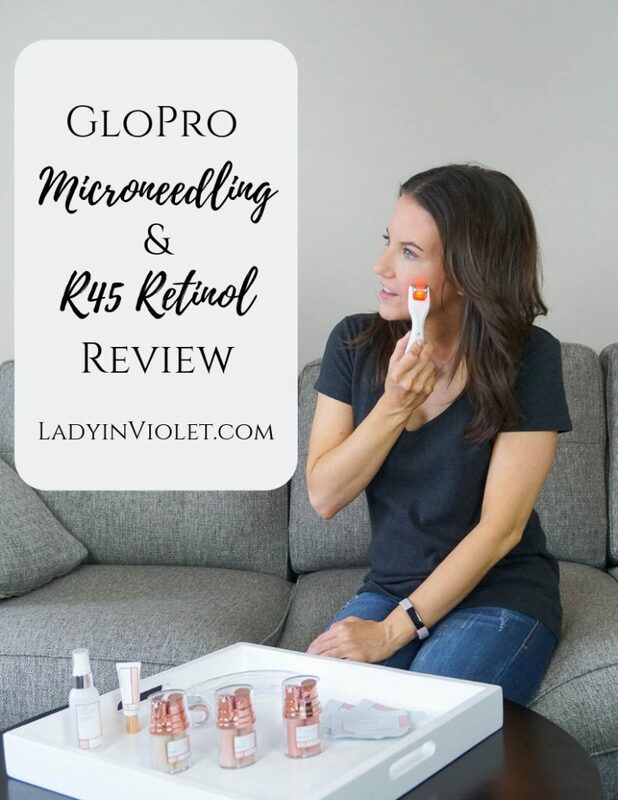 I was super intrigued by two products she mentioned – the GloPro microneedling tool and the R45 Retinol system. Since December, I have been using these two products as my only nighttime skincare routine, and today I am sharing my thoughts on both with you. First off, let’s talk about what exactly a GloPro does to your skin. 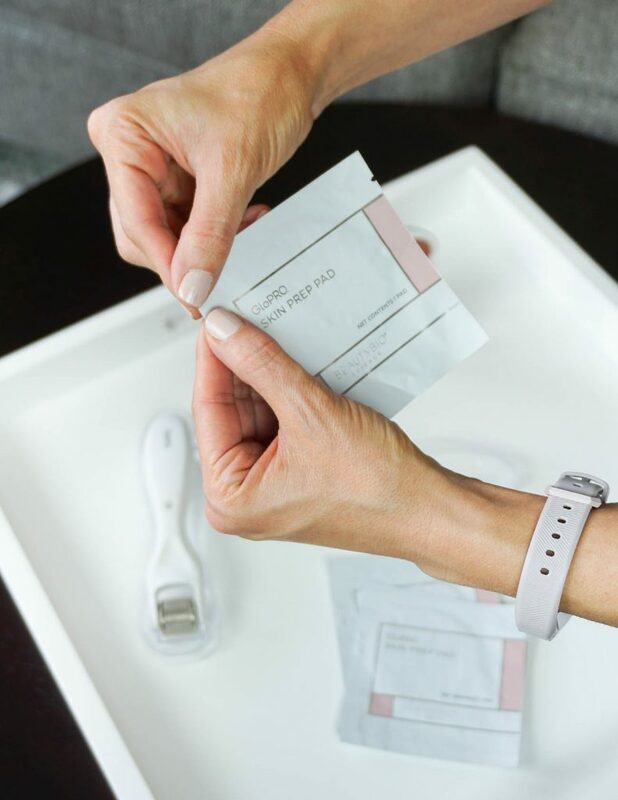 As you roll the GloPro tool over your skin, tiny painless microneedles gently part your skin’s cells and create mini channels into your skin. This triggers your skin’s regeneration response and creates bouncy, new skin cells. Immediately after using your GloPro, your skin will absorb much more of all those fancy creams and serums we put on our face at night. The process is super easy and takes less than 3 minutes each night. 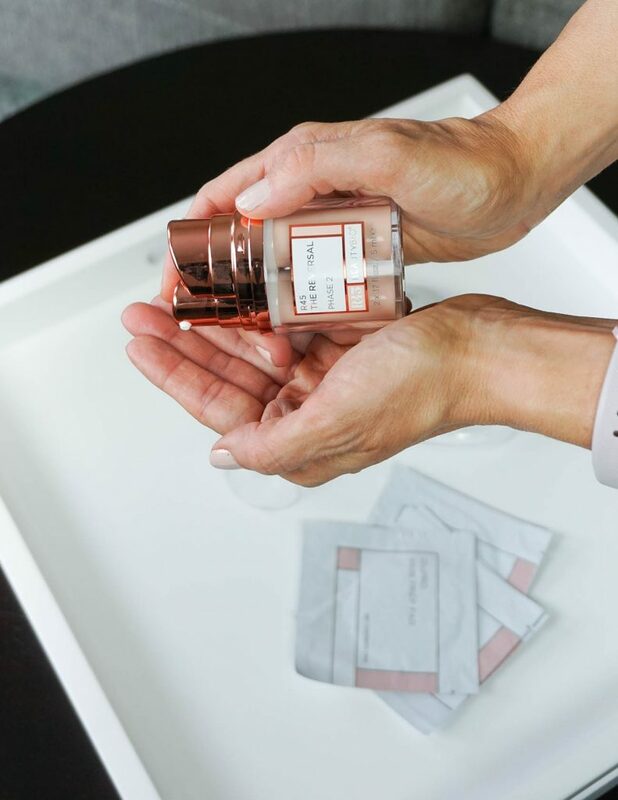 After washing my face, I use a skin prep pad or a cotton pad with toner to give my skin a final cleanse before using my Glo Pro. Then the fun begins, I turn on my GloPro and roll over my face for about 1 minute. 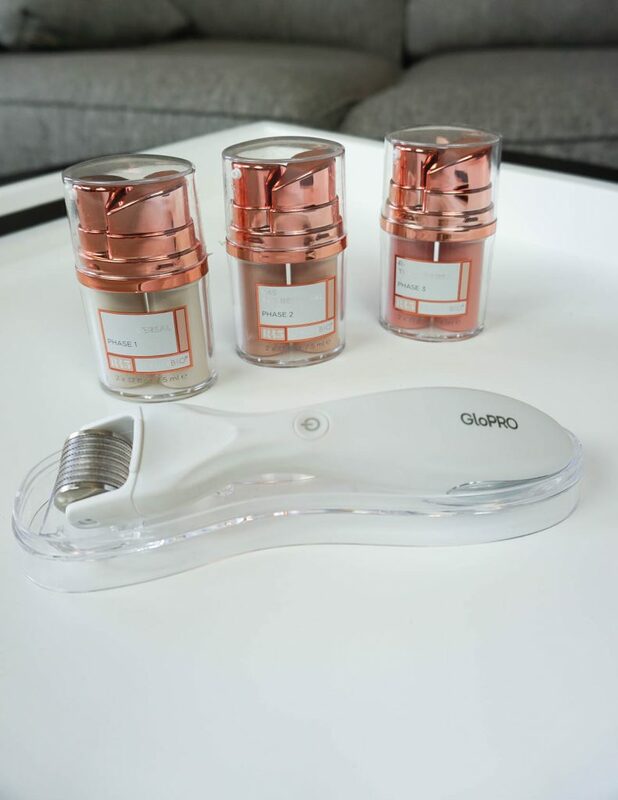 While, I use the GloPro on my entire face, I focus on areas prone to wrinkles and fine lines like forehead, eyes, and around the lips. I roll my GloPro both vertically and horizontally across all areas of my face working in sections. Once I’m done, I immediately apply my nighttime skincare routine. For the past couple months, I have been using the R45 Reversal Retinol cream. This retinol cream helps reduce fine lines and wrinkles, even skin tone, and lighten sun spots. It works in 3 phases with each phase featuring a stronger concentration of retinol to help prevent irritation or dryness from starting out with a strong dosage. This was my first time ever using a retinol product! I loved the results of this one, and I plan to add it into my yearly skincare routine and do the system twice a year. After I’m done, I clean my GloPro by spraying a little rubbing alcohol over the microneedling portion of the tool. And that is it! So easy, simple and quick. So, what about my results? I can definitely tell a difference in my skin tone and texture when I use this GloPro regularly. I’ve also noticed my fine lines improving especially in the forehead area. On a good week, I would use my GloPro and retinol cream about 4-5 times a week skipping nights I faux tan. When I was diligent, my skin glowed. I did have a few busy weeks when I would only GloPro once or twice a week which really showed me how the more consistent you are with use the better your results will be. The microneedling process did not hurt at all or leave my skin red or irritated. The first few nights, it did leave my skin feeling itchy. This went away, so I assume it’s just your skin adjusting to the new procedure. The GloPro has a few other attachments for eyes, lips, and body. I used the body one on a new scar on my arm and it disappeared after a few weeks of use. The body attachment can also help with stretch marks and to firm skin a bit. I just started using the lip attachment and will share my thoughts in a future post, so stay tuned for that one! You do have to buy new microneedling heads about every 3 months, so there is a small upkeep cost. You don’t have to use a Beauty Bio skincare product after use to see the absorption results. You can continue using your favorites and just add the GloPro to help your current products work better. I just wrapped up the Retinol system and plan to start using my serums, oils, and moisturizers now. The GloPro comes with a charger, but I haven’t had to charge mine yet. So do I think it’s worth it? If you are diligent about using it, absolutely! I do think it has made a huge difference in my skin texture and glow. I love the idea that it helps my fancy, sometimes pricey skincare products absorb even more into my skin. I’m excited to see how it works now that I’m finished with the retinol and going back to my normal products. If you have any other questions, feel free to leave them in the comments or email me! Oh Hello Friday! I usually feel like short work weeks seem to drag on forever, but for some reason this one flew by! With my fun packed weekend, I could not be more excited for that too. I have plans with friends and family, and it should all be oh so fun! One of my go to work options in the Spring and Summer is a dress. This utility shirtdress is the perfect Spring work dress and it even comes in under $100! 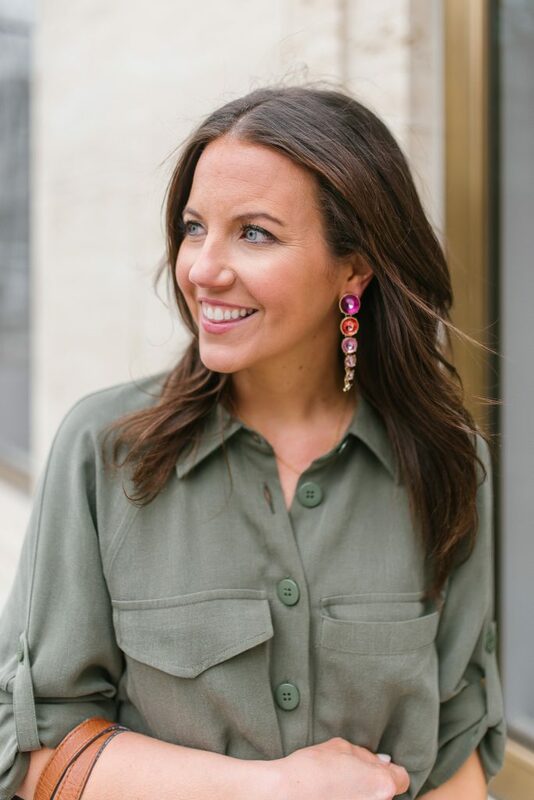 I think the color of this shirtdress can make it work for both the office and a more casual setting. 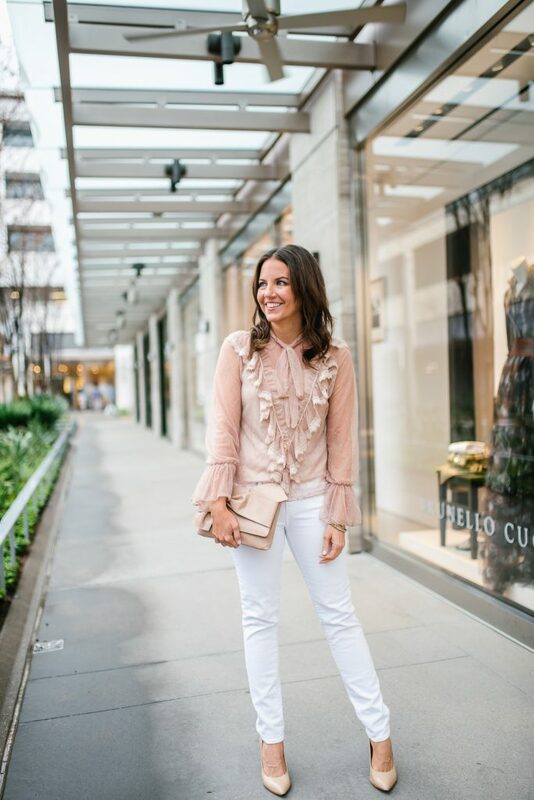 You can pair it with wedges or flat sandals for a weekend brunch or shower look. This brand usually runs small, but with this dress I found it to run just slightly big. I could not resist pairing this gorgeous olive color with my brown peep toe booties. This brown shade is going to be perfect to pair with all the things for Spring! To add a little bit more color to this look, I added in my pink ombre earrings. 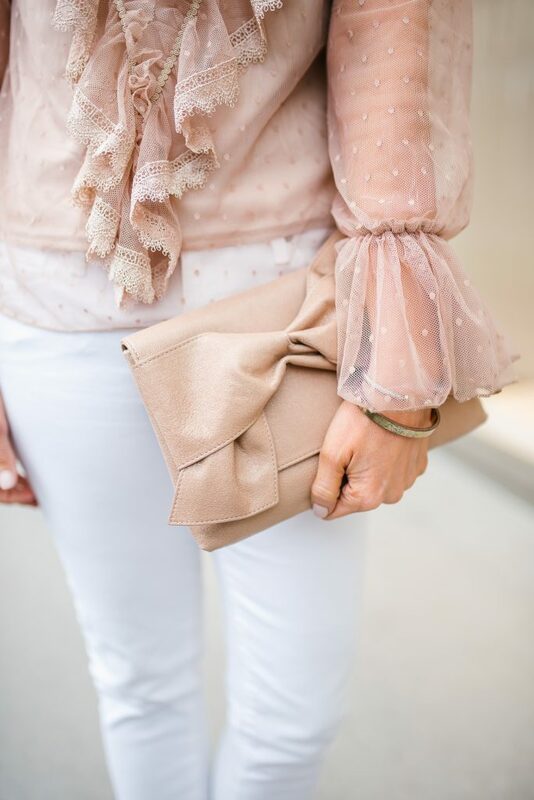 I just love the pink next to the olive color and with the brown, it’s perfection! 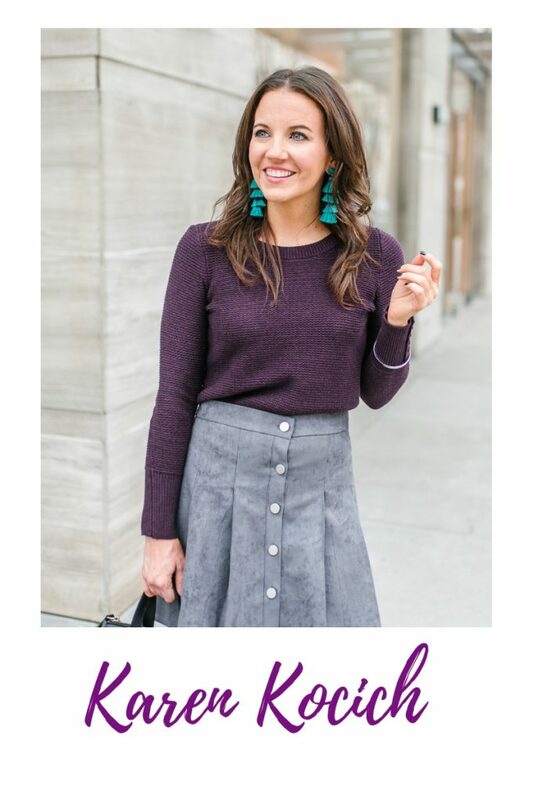 If you want to see my top picks for spring statement earrings, be sure to check out my post from last week! I hope you all have a fabulous weekend and know that I so appreciate you taking some time out of your week to stop by and read. It always amazes me that something that started out as a fun little hobby is slowly growing into something more, and a huge part of that is you guys. So Thank You! Now, let’s weekend! 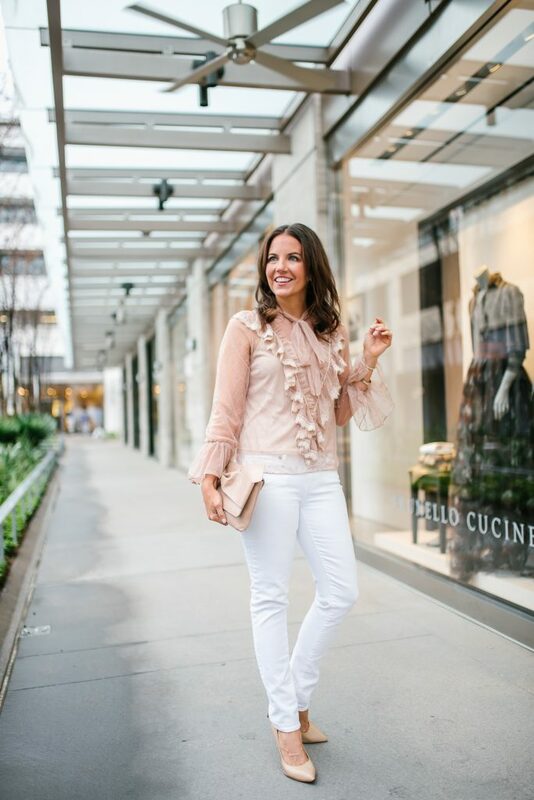 Well, I am venturing a little out of my fashion comfort zone on the blog today to share about another topic I love to talk about, living a healthy lifestyle. A few years ago, I did Whole 30 and it really changed the way I eat. I even shared my journey with you all HERE and HERE. It opened my eyes to how my body responds to the different kinds of food I choose to eat from my appearance to my food cravings. For a the past few years, I have found nutrition interesting, so I started diving deeper into eating more healthy. I found a documentary called In Defense of Food and started to look at food and what I ate in a whole new light. I took the focus off good vs bad and calories and fat. I started focusing on one thing – how is the food I am eating serving my body. I watched more documentaries and read articles, even accidentally purchased a vegan cookbook on my quest to find more plant based recipes and to learn about the nutrients in these recipes. I started noticing how great my skin looked. My high energy levels and focus were amazing when I ate a diet filled with real food that I cooked. I also noticed how sluggish I felt, the skin breakouts, and the strong mid day cravings I got after eating multiple fast food meals, dairy, and too much sugar. I really started paying attention to how different foods affected me and started really enjoying/craving all the vegetables. I stopped worrying about weight, and the craziest thing happened – I started dropping weight without trying. 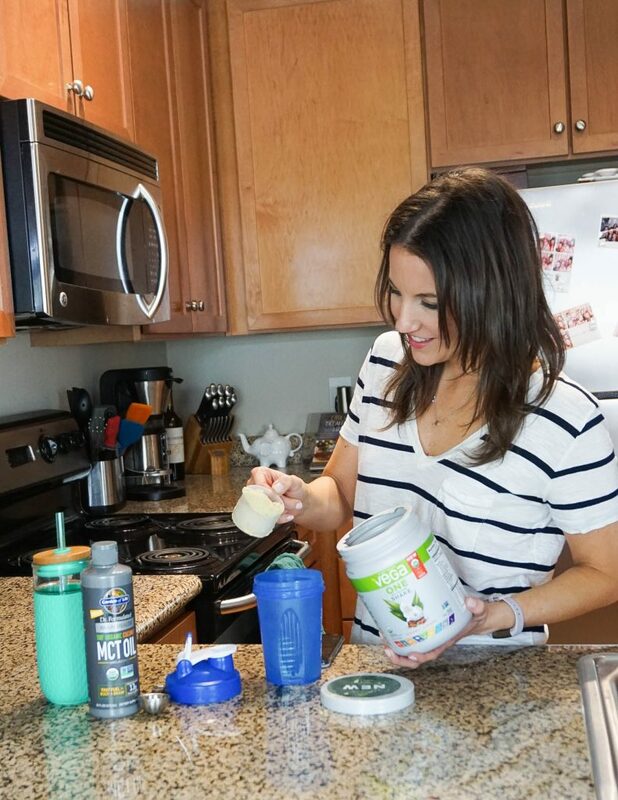 People started noticing and asking what I was doing to lose weight, so I decided to put together a blog post to share what I eat in a week, along with a few of my healthy meal prep and dinner ideas. Also, I do want to mention that the way I eat is based on what makes me feel good. Everyone is different and will need different nutrients for their body. I did tons of research and lots of trial and error to find the best food for me. This post is not intended as a guide on how to eat just a glimpse into what I love to eat on my journey to living a healthy plant based lifestyle. I’m also not perfect. I still eat Whataburger and cupcakes. I still visit the vending machine at work every so often for a bag of Cheetos and will happily share an order of fries. If I’m going to my Grandma’s house, I want her food because it’s comforting and delicious. I don’t believe in depriving yourself. I live under a 90/10 or 80/20 rule. Most of the time I focus on putting all the good nutrients into my body, and sometimes I let myself indulge in a comfort food or small craving. I’ve also learned that the next day I am going to have to fight off some serious craving for more junk food, so I keep healthy options on hand. As I mentioned, I’ve learned how my body and mind responds to different foods. So now that I have shared a brief look at why I eat what I eat, let’s look some of my regular meals. I will note I am someone who can eat the same thing over and over. I meal prep my lunch every Sunday and eat the same thing all 5 days. If you need variety, you could try meal prepping a few weeks at a time and then mixing and matching each week. I’m not a big breakfast person, never have been! I love breakfast food, just not first thing in the morning. My normal Monday through Friday breakfast consists of black coffee mixed with collagen peptides, a Vega One protein shake with MCT Oil, and hot lemon water. I know breakfast really helps set up my hunger levels and cravings for the day. I tried doing eggs and avocado in the morning. I loved how the fat and protein from this meal kept me full until lunch, but most mornings I’m not that hungry. When I skipped breakfast, I would be starving by 10. I found when I switched to a liquid breakfast approach, I was able to make it until lunch before becoming hungry, and I was consistent with breakfast everyday. I stuck with the protein/fat combo with my morning shake. I’m still learning about MCT oil to know just how beneficial it is for me, and I highly recommend doing your own research before trying it out. 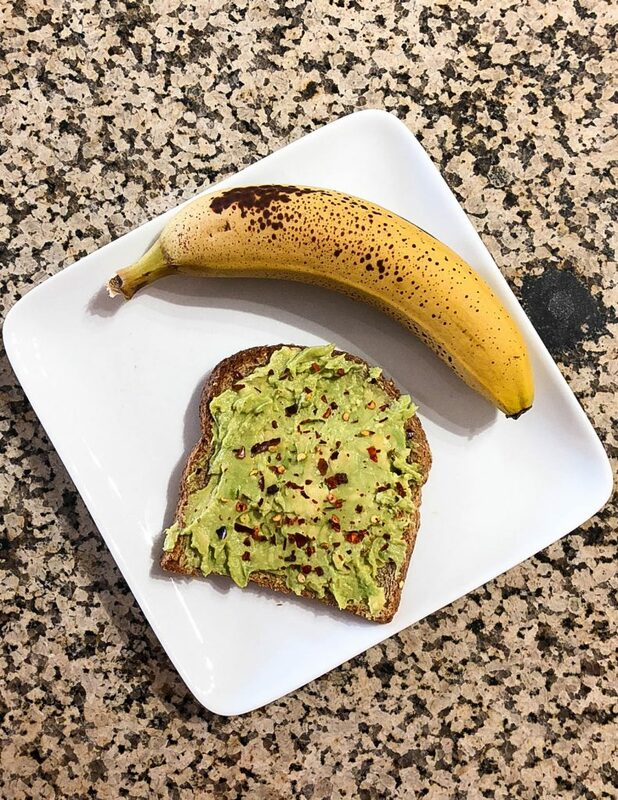 Another breakfast favorite of mine, avocado toast! I know so basic. LOL. I love to sprinkle mine with red pepper flakes or smoked salmon. This breakfast is one I keep on rotation on weekends along with eggs and avocado. 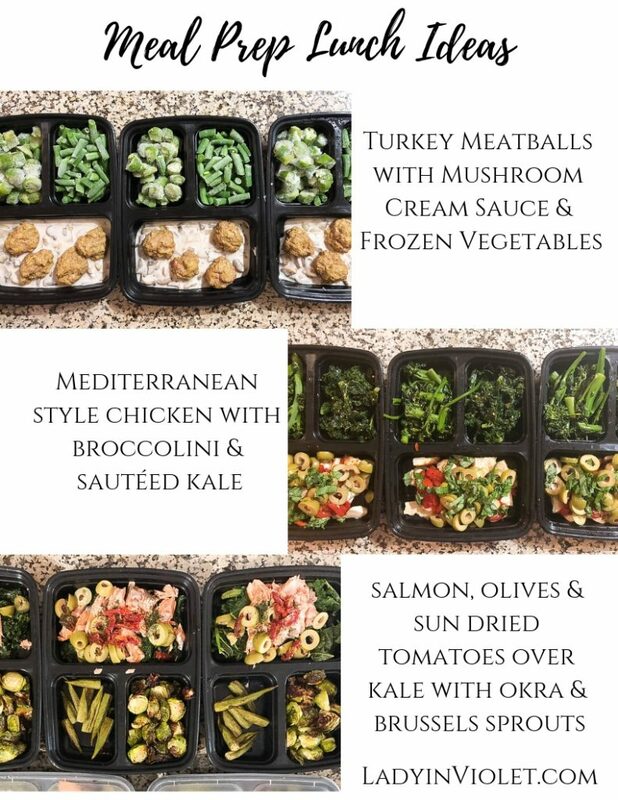 If you follow me on Instagram, these weekly meal prep pics may look familiar. Every Sunday, I meal prep my healthy lunch for the week and share it on Instastories. I typically have a lean protein like turkey, chicken, or salmon along with as many vegetables as I can fit in my container. I also try to find some kind of fat like olives or oils to add to the meal. Every so often, I opt for a vegetarian or vegan lunch option like Eggplant with Tomato Sauce or Lentil “Meat”balls. I usually think about what I’m craving and then head to Pinterest to find a healthy dairy free version of what I want. 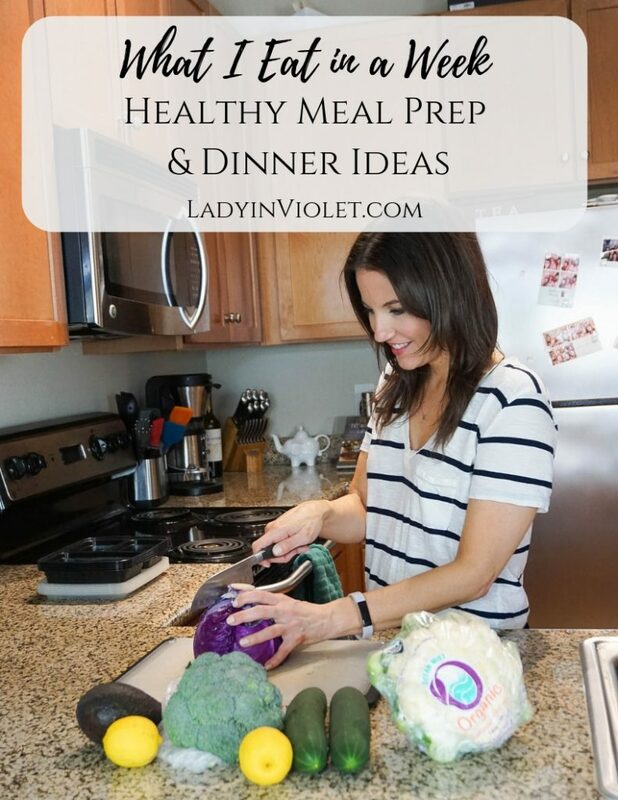 I also love creating healthy recipes, so sometimes I just toss things together and hope for the best. Changing to eating real food meant cooking tons more, so I learned lots along the way about what flavors, foods, and spices go well together which helps with the whole throw things together plan. For my vegetables, I usually pick up 2-3 vegetables that are in season at the store. I’m pretty basic with how I cook them by either roasting in the oven or sautéing. When I’m busy, I will cheat and buy frozen vegetables because it’s quick and easy. A good guide for me on what produce is in season, it’s usually the more affordable options that look really fresh and vibrant. I am a snacker. I try to break the habit, and some days I can go from lunch to dinner without wanting or needing a snack. For days that I need a little something, I keep healthy options in my desk and fridge at work. 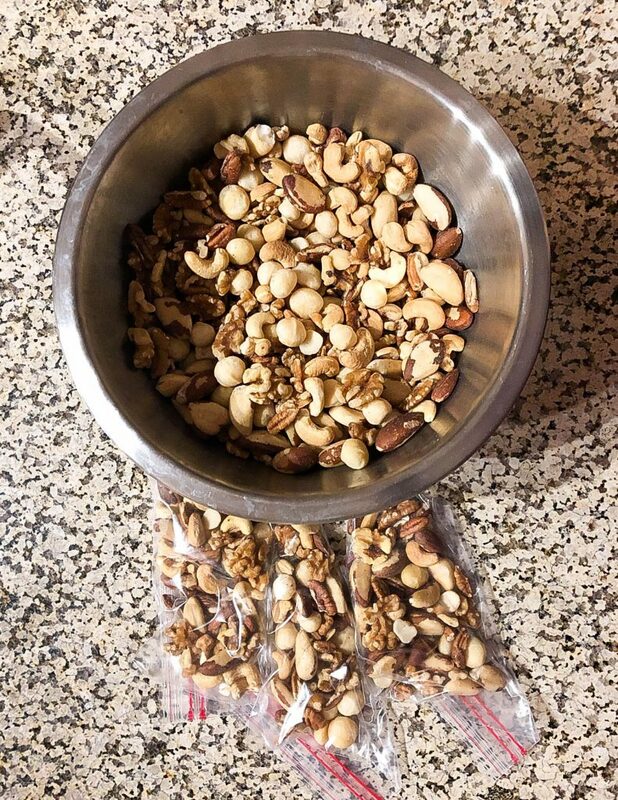 About once a month, I make mixed nut bags. I buy about 4-5 different nuts, toss them all in a bowl, and package them in half cup servings. I keep them in my pantry and desk. A few of my favorite nuts are pistachios, cashews, macadamia nuts, and brazil nuts. A few other favorite snack options are baby carrots with hummus and Cuties/Halos mandarins. Dinner is where I have the most variety and fun with vegetables. 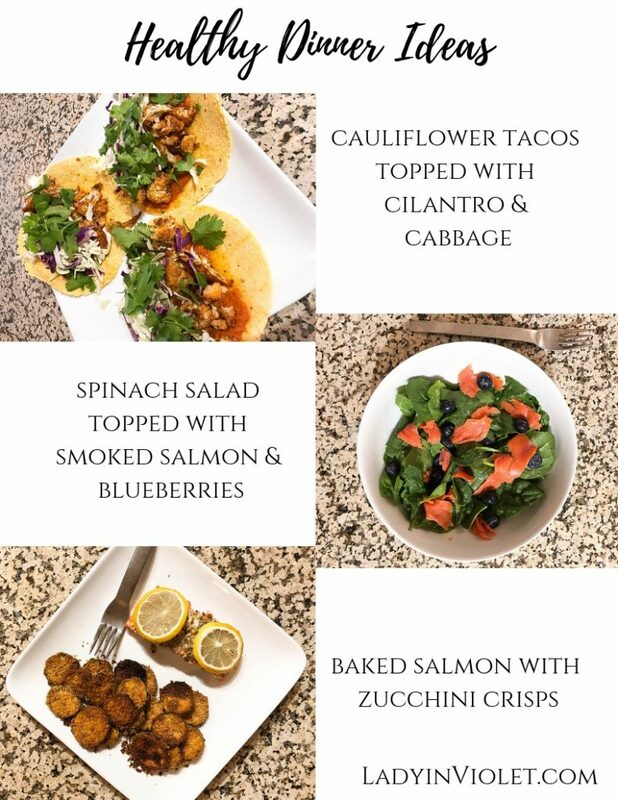 Some days I’m basic with Salmon and a vegetable side and other days I play with some of my favorite recipes like Minimalist Baker’s Cauliflower Tacos. FYI – it’s one of my favorite recipes! I usually buy 2-4 vegetables at the store and cook a different 1 or 2 each night. This helps give me some variety. If I eat meat at night, it’s typically fish and usually salmon. On a night when I’m craving a salad, I love to top it with smoked salmon and a Primal Kitchen salad dressing. Similar to lunch, sometimes I play and toss things together and see what happens. I have found some really good recipes this way. I really focus on eating a variety of colors each week, and I try to buy a new to me vegetable every week or two to keep things different and to keep expanding my options. I don’t eat meat every night. A big bowl of vegetables will satisfy me, and I love using dinner as a time to play with different flavors and vegetables. If you are one of the people who have asked for a look at what and how I eat, I hope this answered some of your questions. A few things you may have noticed, I don’t eat a lot of dairy or sugar. It’s a personal decision that works best for my body. I do still occasionally indulge in cheese and dessert because I love both and don’t feel the need to fully say good bye and deprive myself. I have a HUGE sweet tooth, and sometimes that sweet tooth really wants a cupcake or chocolate cookie. When I treat myself to a yummy dessert, I savor and enjoy every bite. I also don’t eat too many grains or much beef. Every so often I might crave one of these like a nice juicy burger, but I can mostly live without these foods. I put focus on not depriving myself of certain foods, and I also don’t eat something if it’s not my cup of tea. Thanks for sticking with me through this long and different post. I’m planning to start sharing a little more about my love of living a healthy lifestyle, so stay tuned for more!